The FTD Perfect Blooms Bouquet sends your sweetest sentiments to your recipient in honor of any of lifes special occasions. Eye-catching hot pink roses are surrounded by pink Peruvian lilies, hot pink mini carnations, white traditional daisies and lush greens to create an unforgettable flower arrangement. 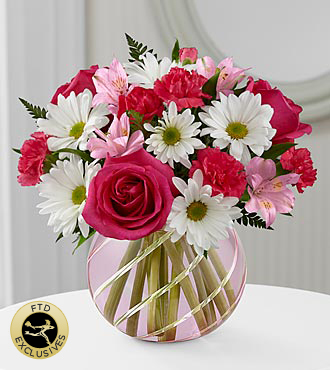 Presented in a pink bubble bowl vase with a cut glass design, this mixed flower bouquet will bring joy and spread smiles in celebration of a birthday, anniversary, the birth of a new baby girl, or as a way to express your love and affection.